Managed by the Scottish Wildlife Trust (SWT) as a nature reserve, Handa Island is a beautiful place and a fantastic day trip. Magnificent sea cliffs on the northern and western sides of the island host one of the largest seabird breeding colonies in N.W Europe. These dramatic sea cliffs rise vertically from the Atlantic and during the summer months are home to around 100,000 breeding seabirds including internationally important numbers of guillemots and razorbills. The cliffs form the focal point for the island with stunning views north to Cape Wrath and south to the point of Stoer. 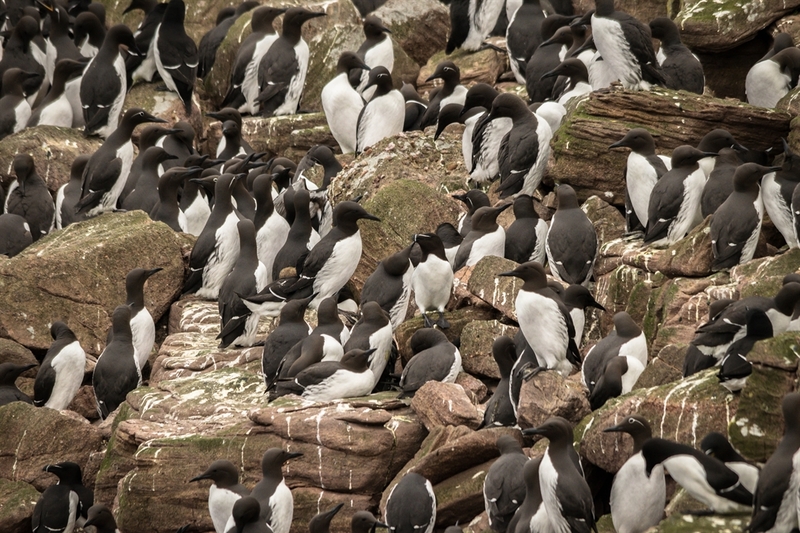 During the breeding season the cliffs come alive, the continual flurry of activity, the sounds and the smells of the colony form an impressive spectacle. From the cliff path you can observe the nesting bird's daily activities from nest building at the start of the season to feeding chicks and defending broods from marauding predators such as the great skua as the season progresses. Kittiwakes and fulmars nest on the cliff ledges and a small number of puffins breed in burrows that line the cliff edges. Exciting sightings of the great skua or 'bonxie' and Arctic skuas are virtually guaranteed across the moorland areas of the island where they nest. There are also several families of red grouse and common snipe on the island, all of which are remarkably approachable. Arctic tern colonies have recently formed on the southern shores and the birds can be seen feeding in the shallows of the landing beach. Aside from the amazing seabird colonies and breathtaking cliffs, Handa offers stunning views of the north-west coast of Scotland and it's characteristic Torridonian sandstone mountains. 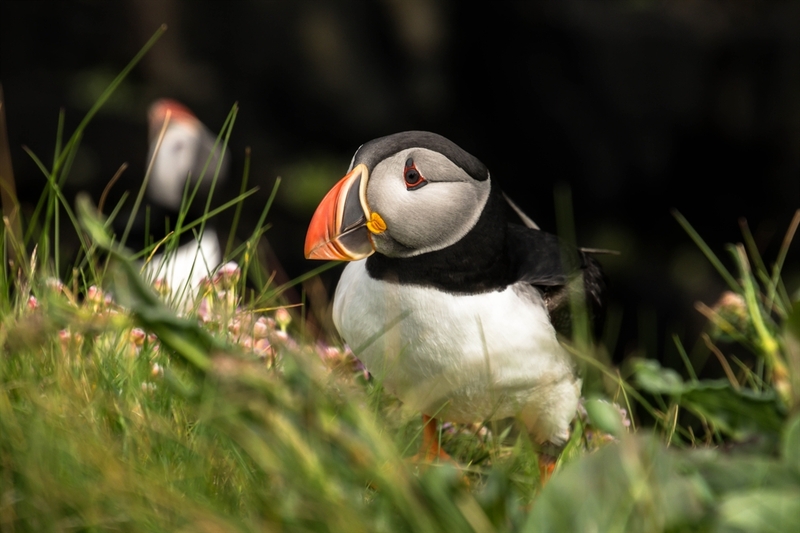 The island has rich and varied plant life and also is an excellent location from which to spot cetaceans such as common dolphin, Risso's dolphin, minke whale and basking sharks. Other points of interest on the island include the archaeological remains of an old village and graveyard, dating back to the last inhabitants of the island in 1847. Handa is accessible by boat from Tarbet, see information below. On arrival to the island visitors will be met by SWT staff/volunteers and given a short introductory talk and a leaflet containing a map. This provides an opportunity to find out about recent sightings on the island and to ask the advice of the rangers. Most visitors spend at least 3 hours on the island. There is a 6km (4 mile) circular with the option of a shorter 4km route up and back to the cliffs. The path is mainly on wooden boardwalk maintained by SWT volunteers, though there are a few rocky and grassy slopes to negotiate. Visitors are asked to stay on the path at all times for their own safety and to avoid disturbing wildlife, particularly the ground nesting birds. As you approach the northern cliffs, take great care. Some parts of these cliffs overhang and are continually eroding. Extremely dangerous areas are roped off but visitors are asked to remain cautious at all times and to refrain from approaching the cliff edge. Tarbet Pier and Handa Island are signposted from the A894 about 3 miles north of Scourie and 3 miles south of Laxford Bridge. Getting there by ferry:- A small ferry boat operates from Tarbet. The service operates early April - early September, Monday - Saturday from 9:30am. Ferry costs £12.50(adults), £5.00 (children). Crossings are on demand and weather dependent. There is no need to book the ferry in advance, simply turn up. The boat will not run in very strong winds, phone 07780967800 to confirm sailing if concerned. Last outbound journey approx. 2:00pm. Last return journey at 4:45pm.